C. Grech, R. Avramidou, A. Beaumont, M. Buzio, N. Sammut and J. Tinembart, "Metrological Characterization of Nuclear Magnetic Resonance Markers for Real-Time Field Control of the CERN ELENA Ring Dipoles," in IEEE Sensors Journal, vol. 18, no. 14, pp. 5826-5833, July15, 15 2018. Field markers in particle accelerators are used to provide a digital trigger when the magnetic field reaches a pre-set threshold. This paper describes the results of a test campaign performed on the extra low energy antiproton decelerator’s main bending dipoles at the European Organization for Nuclear Research (CERN) investigating the behavior of nuclear magnetic resonance (NMRNuclear Magnetic Resonance. 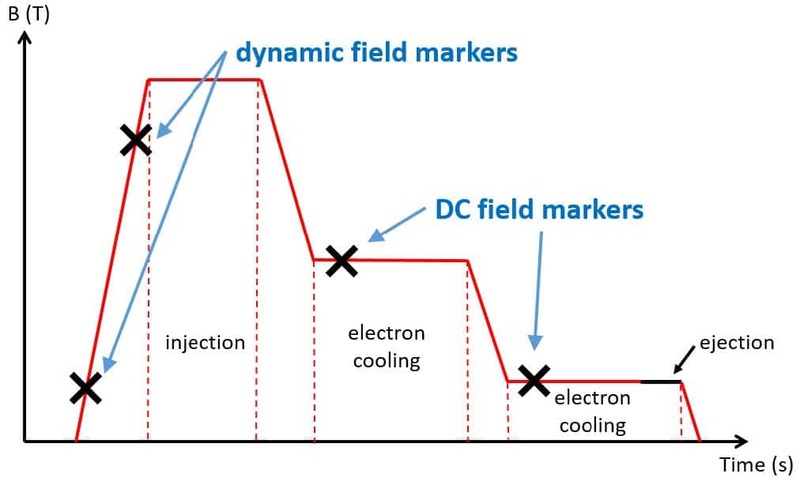 A resonance phenomenon seen when you irradiate a sample in a magnetic field with an RF field....) markers in rampingThe process of injecting current to bring the field up to the operational field. Used particularly for superconducting magnets.... fields. Following the conclusions of an off-line study using a spare dipole, a series of tests performed on the reference magnetA magnet used for calibrating a magnetometer. Reference magnets are often controlled or even regulated by an NMR teslameter.... powered in series with the ring showed an NMRNuclear Magnetic Resonance. A resonance phenomenon seen when you irradiate a sample in a magnetic field with an RF field.... signal with a reproducibility better than 9 µT at field levels lower than 47 mT, using slow ramp rates. This is promising for the real-time field controlAn NMR-controlled field is one whose strength is monitored by NMR. As opposed to NMR-regulated.... of the decelerator. For a high-field marker using high ramp rates, the reproducibility of the signal was found to be better than 3 µT. For the full test of the article, please visit the IEEE Xplore digital library.